No where does the highway safety run more clearly afoul of short term profits than in the area of driver fatigue. It is easy to see how greed can induce truckers to drive longer hours, with shorter breaks, to increase their income. Yet fatigue not only involves the horrific prospect of a trucker falling asleep while behind the wheel of an 80,000 pound vehicle, but it is also slows reaction time, effects judgment and even effects vision. The tired driver is not a safe driver. Profits are not the only incentive, as truckers may push themselves beyond safe limits, for motivations as simple as getting home for the weekend or avoiding day time traffic problems. Regulatory Scheme. It is with the understanding that the individual driver cannot be trusted to use his or her own judgment to know when to quit, that both federal and state regulations impose maximum hours that can be driven, between mandatory rest periods. Maximum Hours: The first requirement is to regulate the maximum amount of hours that can legally be driven. Driver Logs: The second is to require detailed logs of what hours are driven. Auditing of Logs: The third is to implement an auditing plan to assure that logs are kept accurately. 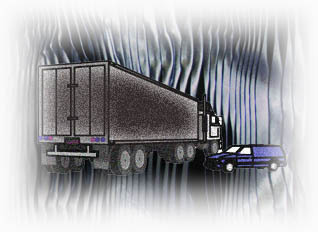 Should Truckers to Drive after Midnight?